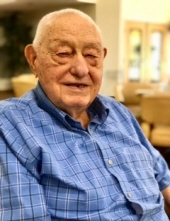 Johnnie Samuel Halcomb, age 93, of Lawrenceville, GA, formerly of Flintville, TN passed away on February 6, 2019. He was born on January 26, 1926 in Albertville, AL to the late Moses & Lula Hasty Halcomb. In addition to his parents, he is preceded in death by his wife: Willie Tripp Halcomb; son: Sammy Halcomb; sisters: Frankie Kilgore and Nelle Pendergrass; and brothers: Troy Halcomb, Leamon Halcomb, Clyde Halcomb and Cecil Halcomb. He is survived by his daughter: Sherri Halcomb; son: Phillip Halcomb; sisters: Inez Daniel and Sarah Patrick; grandson: Moses Halcomb and great grandson: Keith Halcomb. Funeral services will be held on Sunday, February 10, 2019 at 2:00 p.m. in the chapel of Gallant-Riverview Funeral Home with Dr. Jon Hathcock officiating. Burial will follow in Flintville Cemetery. Visitation is Saturday from 6:00 until 8:00 p.m.
"Email Address" would like to share the life celebration of Johnnie Samuel Halcomb. Click on the "link" to go to share a favorite memory or leave a condolence message for the family.